We're taught early in life not to judge a book by its cover, but when that book is literally putting a roof over our head -- and, you know, sleeping in the room next door -- it's OK to judge a little. Or a lot, honestly. But when it comes to selecting an Airbnb, it's far easier to spot a crazy-bad rental than it is a crazy host. Which is why we took it upon ourselves to scour the site for the weirdest, most peculiar, flag-raising ads (based on the host's comments, not the space) and create this handy checklist of surefire signs you're about to rent a room from an insane person. Or at the least, from someone who is very particular. And they do this... twice. As in two separate listings, and two giant pictures of their face. Actually, one of their face, one of their breasts. This isn't a dating profile... or, wait, is it? "The balcony, the kitchen, the bathroom is yours to use! You may cook, or store food in the kitchen. 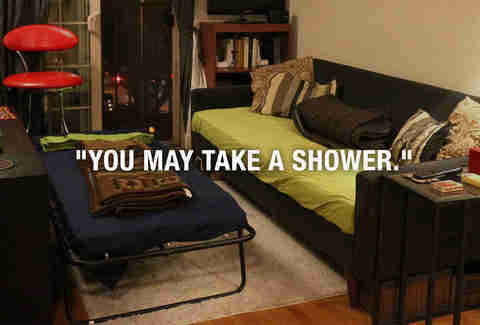 You may take a shower." "Please don't consume food while in bed as this can damage the linens. Please don't use massage oils as this also damages linens. Please be careful with the linens." "Please clean after yourself daily, that includes microwave, toilet, tubs and sink. Don't leave feminine products in bathroom trash cans. Don't leave crusty toothpaste in sink. No hairs to be left behind in tub. Please keep door open while you are away so odors don't linger in the room." "We are a local celebrity family know for taking ordinary places and transforming them using modern design, music, art and food as our magic creating them into extraordinary spaces... Our home is in a very popular urban setting... Some guests say it feels a bit like a mini Manhattan... We are a very social and well known family in Portland and do host special events from time to time. Guests are welcome to join us." "Due to the regrettable fact that my time on Earth is FINITE and there's so much to see & do in the balance of my remaining days, I do not own a TV... HOWEVER comma my building is across the street from the Atlanta Library which, incidentally, is a stunning example of Bauhaus architecture, designed by the 20th century master of Modernism, Marcel Breuer. ":-) :-) :-) :-) :-) :-) :-) :-) :-) :-) :-) :-) :-) :-) :-) :-) :-) :-) :-) :-) :-) :-)"
"Absolutely no smoking without a plastic bag over your head." "Do not drink anything that is considered liquor. You will get 1 towel per day per person. There will not be a second key provided to you for any reason. We will schedule one meeting to check in. If I have ANY complaint from ANY neighbor that you are being too loud you will be kicked out of my home with 0 refund given." They refer to the space as an "ecosystem"
"If you are looking for the most compassionate, joyous, collective, global human experience wrapped up into authentic, unique, hand tended, well loved accommodations... Rosie's Cove is the right place for you! Low rates, clean living, healthy atmosphere and peaceful vibe are generated by a community of guests taking a sense of responsibility and care for enjoying and protecting The Cove's 'ecosystem.'" "This uniquely constructed Gingerbread House at the Isis Oasis Retreat Center is very cozy inside... Earthen trees are wrapping around the hut making it feel as though it were being embraced by the trees... Come ready for an Earthen adventure!" "Please do not sit on the back of the couch." 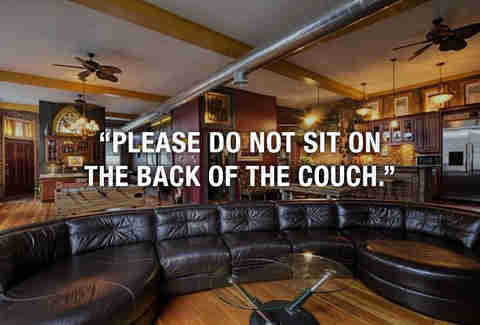 "Please do not sit on the off-white sofa with blue jeans or if so, please cover the sofa with the ceiling before." "ATTENTION, PLEASE READ THIS WHOLE LISTING BEFORE YOU INQUIRE! IF YOU CANNOT MEET THE OBLIGATIONS & RESPONSIBILITIES REQUIRED FOR THIS PARTICULAR SITUATION, PLEASE DO NOT BOTHER TO WRITE ME, YOU ARE ONLY WASTING BOTH OF OUR TIME." 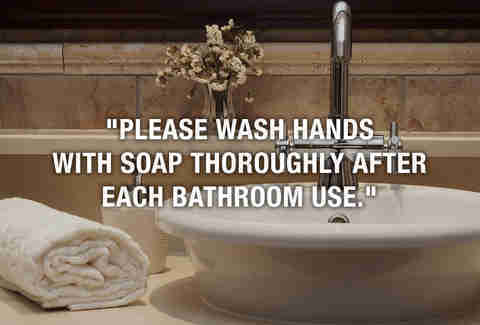 "Please wash hands with soap thoroughly after each bathroom use, and basically wash hands with soap frequently through the day, to prevent transfer of germs throughout apartment." "I have a parrot that stays in her cage and I love her to death. I only let her out when I'm home. Please DO NOT use candles. She's sensitive to any scent of candles. It's toxic and fatal for birds. Also, please DO NOT feed her anything." "Do not go in the garage. This is where we keep the bodies of people who broke the rules." Liz Newman is a freelance writer for Thrillist, and really hopes none of these hosts come after her in her sleep. Or worse, blacklist her. It’s all in good fun, guys! Follow her on Twitter and Instagram at @lizn813.